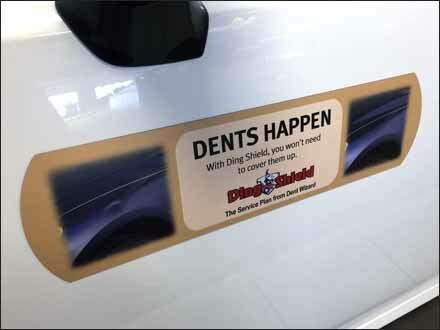 What better point-of-purchase attention compeller for Ding-n-Dent insurance than an oversize Band aid® on the car itself? But be mindful of the theorem “Value = Idea x Execution.” The idea here was brilliant, but the execution falls a bit short. Even in closeup, the bandaid is not immediatelyy and easily recognizable. 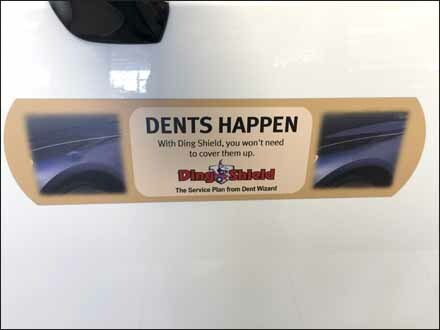 I am sure it was the client (for I usually am one) not the designer who forced addition of the extra blue photos that detract from a Band Aid look. All you creatives, don’t ya just hate us clients and wish we’d keep our fingers out of the concept and execution?